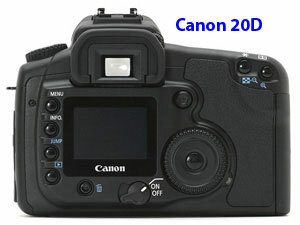 At the end of February, Canon announced the new EOS 30D which will replace the popular 20D. The photos above show the main difference between the 30D and the 20D - a new larger LCD screen on the back of the camera. 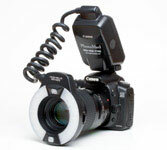 Canon has increased the screen size from 1.8" to 2.5" and the screen resolution from 118,000 pixels to 230, 000 pixels. Very little has changed. The two camera share the same 8.2 megapixel CMOS capture chip along with the same DIGIC II processor and associated electronics. The dimensions and weight are almost identical - the 30D is 2mm thicker and .5 ounces heavier. are now possible when printing through the camera and there is a print button on the back of the camera. 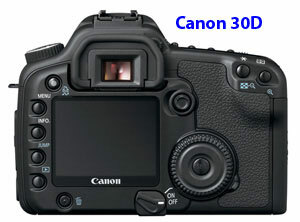 Canon is due to begin shipments of the 30D towards the end of March. The 30D will assume the 20D's price and the 20D has already dropped $100. We are currently taking pre-orders. PhotoMed is the proud recipient of Reality's 2006 New Product of the Year award as well as Reality's 2006 5-Star award for the Canon / PhotoMed 20D digital dental camera system. We would like to thank Drs. Miller and Castellanos and all of the Reality evaluators who chose the 20D. Are you frustrated trying to make sense of the dizzying array of new digital technologies? If there is anyone who understand it all, its Dr. Lorne Lavine of Dental Technology Consultants (DTC). Dr. Lavine and his staff of technical experts will consult with you to determine the best technology for your particular practice and then help you with network design, hardware and software installation, maintenance, upgrades and training. We are finding that, due to spam filtering and "junk mail" filters, you may not receive each and every newsletter issue that we send. Internet service providers (ISPs) are constantly changing how they deal with the massive amount of spam and, unfortunately, legitimate email somtimes gets blocked. We have changed our newsletter subscription page so that we could add a "double opt-in" subscription system. This is becoming necessary so that ISPs can be assured that the newsletter you are receiving is something that you requested and not spam. 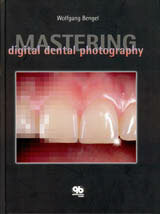 Visit PhotoMed at the Hinman Dental Meeting in Atlanta, March 23-25. We will be in booth #705. We're hoping to have the new Canon 30D with us (if it arrives in time) and we'll of coourse have all of the other great cameras.